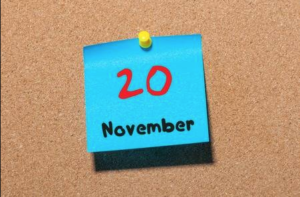 Hello, November 20th! I am so happy to see you! I bet you don’t know what day of the week Nov 20th was on in 2005. Well, I do. It was a Sunday. The Sunday before Thanksgiving. It was also almost my last day on earth. It’s funny the things we don’t know. I am a pharmacist. I am a healthcare provider and I did not know that you could die from a stomach bug. Well, I’m here to tell you that you can. You can absolutely die from a stomach bug and I almost did. On November 20, 2005, I was 31 years old. I had been married to my husband, Bryan for over eight years. We were living in our new home. Our daughter Ellie was three years old and our son Sam was nine months old. Our lives were full! We went to church that morning, and then out to lunch with family. I did not feel 100% myself, but I had no idea what was coming. When we got home from lunch, I felt unusually tired so I went to lie down. Bryan was watching a basketball game while Ellie played and Sam took a nap. Early that afternoon, my symptoms started. It was a very bad stomach virus. I had not had a stomach bug since I was 16 years old. I guess it came to me with a vengeance, because it hit me fast and hard! I was very sick for hours and I found myself completely lethargic, lying on the bathroom floor. I managed to pull myself up and look in the mirror. I looked gray and I was scared. The TV was on in the den and I was in our master bathroom. Bryan had no idea how fast things had progressed or how seriously ill I was. I did not have the strength to call to him loud enough for him to hear me, so I crawled to my bed and thought I would just sleep it off. As I started to drift off, I felt God urge me not to sleep. About that time, Bryan came in to check on me. He panicked when he saw me! I had never been this sick before. He called my Mom to come over and stay with the kids and we drove to the ER. At this point, I was very dizzy and things were blurry. By the time we arrived to the hospital, by kidneys were shutting down. My pulse was around 170 beats per minute and my blood pressure was 65/39 (normal is 120/80). The doctors told Bryan to call the family. This was a serious situation we were in. They also told Bryan that if I would have tried to “sleep it off,” I would have died. A whole team of folks came over to start working on me. Over the next few hours, they gave me EIGHT liters of fluid in order to make my kidneys start working again. I was given multiple antibiotics and was monitored very closely for the next few days. After several days in the hospital, my body began to improve, but I was not out of the woods yet. Over the next six months, I struggled with more dehydration. I continued to have virus-like symptoms and was in and out of the ER getting bags of fluid. My resting heart rate was between 115-130 bpm (normal resting is around 70 bpm), so my heart was working like I was running a marathon at all times. This made me lose significant weight. I weighed under 100 pounds even though I forced myself to eat. Everything went straight through me and I was a mess. I had no energy…none! I could not take care of my family. I was out of work and I wondered if I would ever get better. I went through anxiety and bouts of depression like I had never experienced in the past. I wondered if God heard my cries. I wondered if this would be my new normal. I prayed and prayed, begging God to fix this, but my body would not get back to normal. My primary care physician was perplexed with what was going on with me. I was so young. Why could I not get better? I saw every kind of specialist under the sun in hopes of finding an answer to this illness. Although it took a full year for me to get back to having 90% of the energy I had before, life did get back to a more normal state. Slowly, my body recovered, but I was not the same person I was before November 20, 2005. This time in my life was dark and uncertain, but do you know what happened through this experience? I gained a fresh appreciation for the little things in life. My marriage grew stronger and I learned that every single day is a blessing from God! I grew closer to God through that experience like never before. I came to the end of my rope and I had a choice to make. Do I believe God to be who He says He is, or not? I decided to believe God and somehow, someway, He would work this illness for good. So here we are again…It’s Nov 20th. It’s the week of Thanksgiving. This is the season of Thankfulness. It is the season of Gratitude! I believe one of the keys to living a happy life is to have a grateful heart. Being grateful to God for who He is and all He has done for you, is the starting point. You see, when your heart is set on being grateful, there’s no room for complaining. When your heart is set on being grateful, there is no room for bitterness. When your heart is set on being grateful, there is no room for unforgiveness. Sure—life is hard. Sometimes it is really hard! People let you down. Sickness comes. Dreams are broken. Money is uncertain. If we look hard enough, we can always find something to complain about. But you know what else? When we look hard enough, we can always find something to be grateful for, too. Why don’t we choose to focus on that, instead? So, hello to you November 20th, 2018! I am so grateful to see you!